Sample Cash Memo Format can be used as Cash Memo, cash memo bill in shop and office. 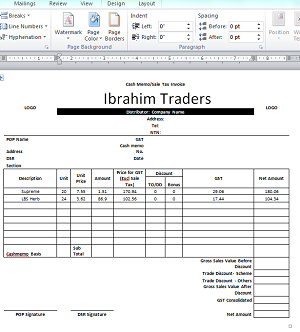 You can download this Cash Memo Format in MS Excel and can customize it according to your needs. Cash memo format includes item names, description, unit, unit price, tax, discounts and net amount with tax and without tax. It also includes approval authority signatures, logo of distributor and manufacturer and other details of the company like address, telephone and city with NTN number. Just download the format in Excel and fill all the sections with your company information. Cash memo is ready. If you couldn’t found the attachment please copy the above format and paste it in Ms Excel file. Your format will be ready to be used.